It’s May 4th around 8:45pm at the MGM Grand Garden Arena in Las Vegas Nevada. Down a gritty and grimy hallway are doors to a locker room. Inside sits a boxer on a bench with his trunks and shoes on, with a warm towel draped over his shoulders to help relieve a neck ache from the night before. A pair of Dr. Dre Beats headphones are suffocating his eardrums with entertaining lyrics, rhythms, and rhymes. He doesn’t hear the music though, instead there’s a boxing match going on inside his head between his conscience and his will power. All he can hear are the voices of critics, fans, and other boxers calling him a punk, a chump, and a downright bum. His eyes are closed, as he tries to block out the loud vicious voices of doubt and discrimination. The music from the headphones starts to return as background noise now, he breathes in as his will power delivers a haymaker to his conscience to send him collapsing to the canvas once more. On the breathe out his eyes open, the music cuts off as he removes the head phones. He rises from the bench, puts on his promotional gear, and makes his way out to the ring. As the introductions are concluded and the first bell is about to sound, he looks around one final time to see the same thing he always has. Hundreds of thousands of eyes all watching and waiting to witness something they have never seen. They are all anticipating him to lose. The Man in the Ring: Is none other than Floyd “Money” Mayweather Jr.
One of Boxing’s Best: This Saturday May 4th at 9pm Floyd Mayweather Jr. will face Robert Guerrero for the Welterweight title belt in Las Vegas. “Money” Mayweather will once again put his perfect record on the line in front of millions via the Pay-Per-View event that is simply being called “MayDay”. At 43-0 with 26 KO’s in 43 fights within five different weight classes earning five title belts in all, Mayweather has established himself as one of the best pound-for-pound boxers of all-time. In fact, he is arguably one of the best boxers this generation of fans has ever seen put on a pair of gloves. Mayweather has beaten every opponent thrown his way and has reeled in more money than any major sports athlete could ever dream to collect. For Mayweather though, its not all about making money, its about making history. With each win, he’s etching himself further into the boxing history books as one of the best boxers to step into the ring. However, there has always been one opponent Mayweather has never been able to beat…the critic. Whether it has been fans, boxing experts, or other boxers themselves, “Money” has always been shortchanged by nearly everyone around him. During almost every fight for as far back as I can remember, most of the fans are paying to see one thing…Pretty Boy Floyd finally fall. This is what most fans ultimately want, to see what would seem to be the impossible. Granted, Mayweather has had a few low-points outside of the ring in his personal life. However, this article will solely focus on his professional career. 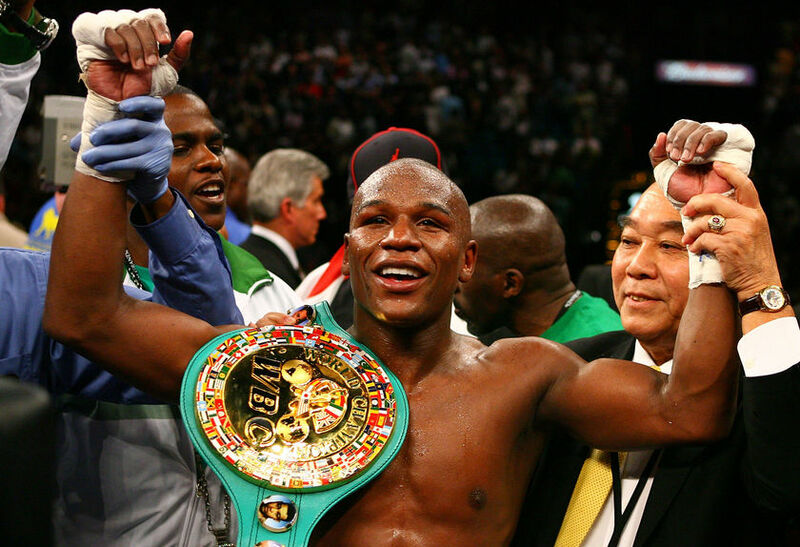 The Pressure of Perfection: Floyd Mayweather Jr. has fought 43 times and has never lost a bout. Let me type that out for you again, he has boxed 43 times and he has NEVER lost a fight. Now sit back for a second and truly think about that statistic by itself. After you’ve thought about that, consider this: In every other major sport almost EVERY team or individual has lost at some point in their season or career. To give you a few examples: the 1995-1996 Chicago Bulls lost 10 games in their 72 win season. The 2007 New England Patriots lost in the Super Bowl after going 16-0 in the regular season to finish the year at 18-1. Even some of greatest boxers to ever grace the sport with their gloves have lost a few fights. The Almighty Muhammad Ali lost five fights in his career, Sugar Ray Robinson has one of the best boxing win-loss records of all-time with 179 wins, but even he lost 19 times. Jack Johnson, one of the first legends of the sport, won 73 bouts losing 13 as well. Even Willie Pep, the man with boxing most impressive record of 229 wins, lost a total of 11 times in his epic career. Just so we’re clear, I’m not comparing Mayweather to the aforementioned boxers above, because that would be like comparing apples to oranges. However, his career could wind up being spoken in the same breath as some of those gentleman,much the way Rocky Marciano’s has been. Marciano finished his boxing career with an impressive 49-0 record. When you consider those numbers, what “Money” Mayweather has done in his career can’t be claimed as chump change. Final Thoughts: I tried to avoid bringing up Manny Pacquiao in this piece, but realized I’d only be telling half the story if I chose to ignore one of the biggest criticisms Mayweather has faced in recent years. For the past few years a mega-match has been on again and off again between these two top pound-for-pound fighters. While there have been rumors and speculation surrounding this mythical match each time, it means little to Mayweather’s career. It will not matter if Mayweather never fights Pacquiao, because like those boxing greats I mentioned earlier, “Pacman” has also lost his share of bouts, four to be exact. Of those four losses, two of them account for his last two fights. In one of those bouts he lost the World Boxing Organization Welterweight title to Timothy Bradley, in the other he was knocked out by Juan Manuel Marquez. Mayweather won by unanimous decision against Marquez to earn his 40th win for his career back in 2009. The only thing that should matter to Mayweather, is his upcoming fight. Because few boxers can say in their career, they were the one man that simply couldn’t be beaten. However, this won’t change the fact that this Saturday (May 4th) everyone will be watching and waiting to see the other guy win. In Conclusion: While most will never deem him as one of the greats, he has undoubtedly done more than enough to earn the credit he deserves. Whether you loathe him or love him, Floyd “Money” Mayweather Jr. is without question one of the best boxers we’ve seen in quite some time. This entry was posted in Everything Else and tagged "Money Mayweather, boxing, Floyd Mayweather Jr., Las Vegas, Manny Pacquiao, MGM Grand Garden Arena by tsmithbsb29. Bookmark the permalink.